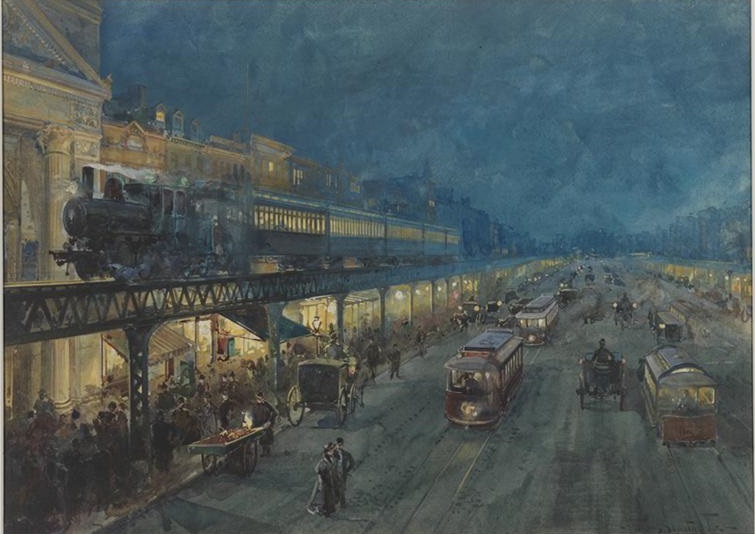 Story of the Week: W. L. S.
Bowery at Night, c. 1895, watercolor by William Louis Sonntag Jr. From the collections of the Museum of the City of New York. 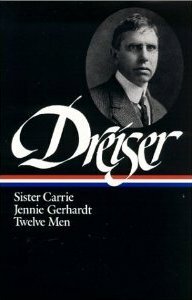 A biographical profile by Thomas P. Riggio reminds us that, although Theodore Dreiser is “remembered primarily for his novels, he wrote in many genres. In fact, of his twenty-seven published books only eight are novels—and two of these, The Bulwark and The Stoic were published posthumously.” He also wrote journalism, short stories, poetry, plays, travel books, memoirs, essays, and social criticism. In the 1919 collection Twelve Men he gathered two decades’ worth of sketches of friends and acquaintances he had admired. Among the dozen was William Louis Sonntag Jr., the W.L.S. of this week’s selection. Dreiser originally published his profile of Sonntag as “The Color of To-Day” in Harper’s in 1901. Fourteen years later, he would further immortalize Sonntag in the character Eugene Witla, the painter-hero of the novel The “Genius”—a portrayal also inspired by another Ashcan painter, Everett Shinn, and by Dreiser himself. The novel was almost immediately banned by The New York Society for the Suppression of Vice and condemned in the press for its frank sexual themes (“A Riot of Eroticism” and “Mr. Dreiser Chooses a Tom-Cat for a Hero” were typical review titles). After a lengthy court battle, the book was finally re-issued in 1923. Notes: The New York Central No. 999 (p. 1121) is alleged to have been the first locomotive to exceed 100 mph in speed. The Baldwin Company (p. 1121) is shorthand for Baldwin Locomotive Works, a Pennsylvania-based company founded in 1825. The Hoffman House (p. 1129) was a grand hotel located near Madison Square in Manhattan. Life’s little ironies are not always manifest. We hear distant rumbling sounds of its tragedies, but rarely are we permitted to witness the reality. Therefore the real incidents which I am about to relate may have some value. . . . If you don't see the full story below, click here (PDF) or click here (Google Docs) to read it—free!